Use this Barb Tubing Coupling Valve to connect two sections of tubing with shut-off valve. 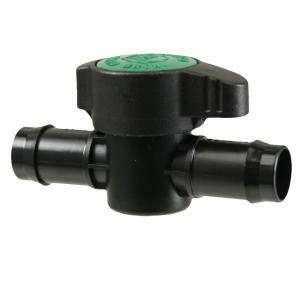 Valves are great to control, disperse, slow and/or divert water in all drip irrigation systems. Quality barbed acetal fittings provide high retention in low-pressure poly tubing for long-term reliability of connections. These fittings can be confidently installed without clamps when matched with our quality low-pressure poly tubing with corresponding dimensions. Special Note: 1/4" barbed fittings have the unique ability to be "snapped" into larger tubing after punching a hole into the side of the larger tubing with any of our 1/4" punch tools. This creates a water-tight seal and allows you to "tee-off" of larger diameter tubing using only 1/4" fittings and a hole punch.